I’ve been trying to get a picture or video of the bees on my patio, with no success. No matter how many bees are around, I always wind up with a picture completely devoid of bees; in fact, I don’t even see them when I look through the viewfinder. This is probably because I’m taking the pictures from a distance (because they’re bees, and they’ve already stung me once), or because I’m not a very good photographer, or because my cellphone camera just isn’t up to the job of photographing small insects flying rapidly with bad lighting conditions from a distance. At least, that’s what I keep telling myself. But no matter how hard I try to rationalize, I just can’t ignore the fact that the simplest explanation is that I’m dealing with vampire bees. The bees don’t show up in photos or video. I’ve never seen their reflection in a mirror. They’ve exhibited unnatural behavior; specifically, stinging me without provocation. I found that last one particularly troubling, so I decided to do some research. It turns out that googling “vampire bee” yields about 1370 hits, all of which seem to be about apian vampires (as opposed to, say, some sort of competition in which people try to spell vampire names or answer vampire trivia questions). But apart from one site with a picture of a vampire bee emerging from a bee-sized coffin, there doesn’t seem to be a lot of practical information out there. So I guess I’m on my own. I have no idea what the long-term effects are of a vampire bee sting, but so far I haven’t noticed any unusual cravings for honey, pollen, or human blood, so I’m cautiously optimistic. Update, July 20: Reader retmeishka posted a link to a picture of a vampire bee biting the neck of a flower. This provides us with an important new bit of information: apparently it is possible to photograph a vampire bee, but only when it’s feeding. Update, July 27: Apparently, the vampires in Twilight are butterflies. Of course, this only applies to sparkly vampire humans; vampire bees are a different species entirely. The bee saga concludes with this vampire bee update. Oh no, Twilight better watch out, there’s a new story on the front! I think that you should write a book. It would easily outsell the twilight series…Maybe…Hopefully! Anyway I like the idea. Any strange side effects of being stung? Stopping of aging? Alabaster complexion? Growing a stinger? Craving pollen? I do have this strange compulsion to scratch the back of my right index finger (which, coincidentally, is where I was stung). Google “nectar robbers” or “nectar robbing.” I took a photo of a vampire bee (and I got lucky, it allowed itself to show up on camera!) biting into the neck of a flower to get the nectar, instead of entering through the front of the flower. http://www.flickr.com/photos/eagledove9/2882637755/. When you watch them up close, you can actually see them sticking their sharp, piercing little tongue probe through the stem. It’s fascinating. Vampire bees are real. So apparently it’s possible to photograph a vampire bee when it’s feeding. Thank you — I’ve updated my post with this important information. Vamipre bees. Yep. Sounds legit to me. I’m firmly convinced that vampire bees are as real as any other vampire. Thats a Very nicely written post about your apprehension.. With loads of humor.. This is a great post! I’m glad I hopped on here to read it. Funny. When my son was much younger, he once told me out of the blue that “zombie bees” would be much scarier than regular bees or zombies for three reasons: first, because the name sounded weird (which he demonstrated by saying “zom-beee-beee”) second, because their stings would probably hurt worse than regular bees, and third, because it would be far harder to keep them out of the house by simply boarding up the doors and windows like people do with regular zombies. I love kid logic. His last point is actually pretty compelling. I can’t help but wonder: are werewolf bees more photogenic? Do werewolf bees turn into regular wolves or into tiny, bee-sized wolves? Hello there, love the article and wondered if you fancy letting us use it on our Vampire Awareness Blog over at my account? Thanks! Yes, I’d be happy to have you use it. I was wondering about vampire taxi drivers – do their cars show up on speed cameras! Anyways – vampire bees? Brilliant! Though probably not good on a sunny day day in the garden. Béela Lugosi – “children of the night – thrum to me”. Heard a nice joke about bees the other day – “Dad, what’s a wasp!” Reply: “It’s a gay bee, son”. I’ve learned from my own bee colony that if you don’t see them producing honey or beeswax, there’s a good chance they’re mason or carpenter bees. Perhaps you’d have some luck if you installed a tri-pod near the hive. Hilarious post. I was still waiting for the invasion of the Killer Bees. Now this. Yikes. So, if they’re “Vampire Bees”, if they sting you, do you…become a Vampire Bee? Or do you slowly turn yellow, start liking flowers abnormally much and start shrinking before you’re supposed to? 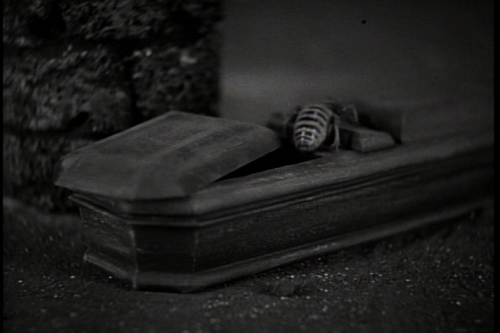 The coffin and the vampire bee climbing out is too funny! Whatever you do, don’t invite them in the house. Yeesh. And driving a stake through their hearts would be really difficult. Probably, but I’m still carrying toothpicks with me, just in case. I’ve never been stung by a bee, and I definitely don’t want to be stung by a vampire bee! Vampire Bees…haha I like this post. I’ve been stung once in my life and it was by a wasp that swelled my cheek up to look like I had stuck a golf in my mouth. Good luck with them! What other possible conclusion could there be-e? Hate to say it, but please, for the sake of all humanity, isolate yourself. And not just a fenced-in area -there’s always the miniscule but terrifying chance that you’ll sprout wings and defy every known law of aviation. You will be missed. Probably moreso by people who know you, but I’ll be sad for a a second or -Shiny thing! Bye! I was referred to this post from my recent article on the elusive (and fictional) Vampire Beetle. (Warning – not PG.) http://birdsaresmart.blogspot.com/2010/07/encounters-with-vampire-beetles.html I’m glad I’m not the only person w/uncanny questions about insects. Vampire bees! How would you stake them? Are toothpicks small enough? Lol. Get an SLR camera with a macro lense and that will solve your problem. You’ll be able to take pictures of the vampire BEEEEES!!! LOL! Cute post! And anything with the word “vampire” in always gets my attention! I don’t know about vampire ‘bees’, but vampire hornets are quite possible! They infect insects with larvae and I know I saw it through Discovery channel. Maybe try some Off to see if that keeps them away from you, but that may just be mosquitoes though. In my old house I had been often attacked by bees in the night. They were trying to enter the house and sting me. If I closed the window, they wood just start hitting into it. It was very scary. At first I thought they were attracted by the light, but these incidents were happening mostly with lights switched off! Have any of you seen bees flying in the middle of the night? There might be some other kind of bees, like already mentioned zombee bees, ghost bees, possessed bees, vampire bees, devil bees, canibal bees and even blood thirsty stinging evil vampire possessed zombee canibal ghost bees mutant aliens. Are they sparklely Twilight vampire bees, or burst into flames/turn into dust Buffy the Vampire Slayer vampire bees? They definitely don’t sparkle. They don’t burst into flames either, but they’ve been staying mostly in the shade, not in direct sunlight. Truly a great observation and nice post. The etymological meaning of my name is bee, so I’ve seen much and much things on bees, but that’s the funniest I’ve ever read so far!